Just an idea of some of the testing that has been carried out to ensure an archival product. 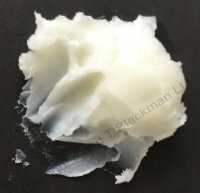 The image left is just one example of the testing of the wax with pigments. This one is on heavy watercolour paper and has lived a 'very rough' life as part of the testing process. Over twelve years it has been subjected to; bending, folding, stretching, dry heat, damp, frost, dark, compression, baking and more. The wax has not cracked, flaked or peeled off the surface, the dust cleaned off easy, the surface could be buffed/polished, the colours were still true. 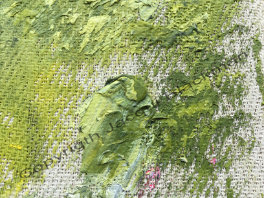 The image right is wax and oil paint applied to a very heavy, highly textured raw canvas, it has been applied both very thick (impasto) and very thin (glaze). This test piece is now over eleven years old, the canvas has been subject to many trials and stressors, it is still adhering as expected. The quality and depth of the canvas weave allows the mixture to have a good 'toothy' surface and it has not cracked or chipped, it's doing very well. The image left is wax and oil paint painted thickly onto handmade paper, like the above tests a few years old now. Wax and Oil on paper have a synergy. 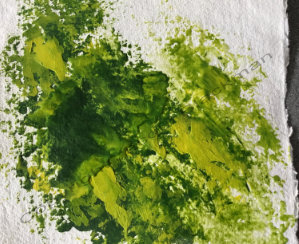 Try Two Rivers handmade paper for the unusual and for their 'paper boards' or 'tablet', if you like a rough surface, these are excellent to paint on. 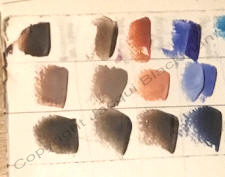 It was also tested on St Cuthbert's Mill papers; Saunders Waterford; Bockingford and Millford (old Whatman equiv. ), Rives and Somerset are papers used for printmaking, also Arches Oil painting paper and many other papers. The paper surfaces mentioned above are excellent for Wax and Oil. Not all watercolour papers work so well, priming them works better. 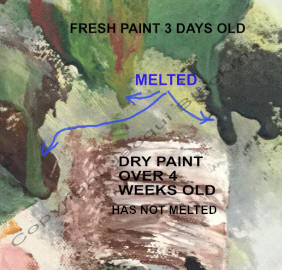 You may have read that Cold Wax and Oil cannot be painted onto flexible surfaces, that has not been my findings following these tests. The image right is of wax and pigment on paper and is over 14 years old, it has been open to all eventualities during that time. The Wax is still well adhered to this flexible surface, the paper is still in very good condition, although slightly discoloured from storage conditions and being unprotected. 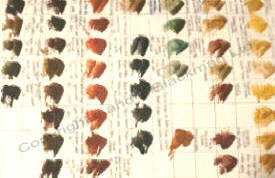 Adding dry pigments and solids has not caused any deterioration of the surface of the paper or the wax mixture. Test baked in summer sunshine for 6 hours! There have been murmurings over the years about the stability of wax in painting, even though there is historical proof in the form of 'works' in Museums that are beeswax and hundreds of years old. One of the characteristics that causes hesitation is that the painting may 'just melt like a beeswax candle'. It does take quite considerable heat to melt the beeswax, more than is normal in the rooms of most residential building. To test this, I placed a sample canvas on the roof of a building in summer sunshine for 6 hours with an average temperature of over 32°C but the roof surface was much hotter. The freshly painted wax/oil did start to soften and move, the dry painted area didn't. This is an extreme test, but at least I now know that a wax/oil mixture, once dry, will be stable under normal conditions.